Country music icon, Martina McBride, is a household name. 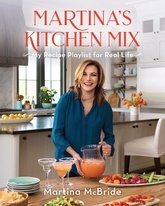 When she’s not on the road, on stage, or in the studio, you’ll most likely find her at home cooking in the kitchen, nurturing family and friends with her delicious recipes. In her second cookbook, readers will find more than 100 simple and satisfying recipes that entice with fresh, seasonal ingredients and downhome flavor. Follow her inspired ideas for feeding a handful or a houseful. Whip up her favorite Sunday Brunch menu, toast friends at sunset, or serve up a refreshing summer supper. Her mouth-watering recipes are sure to become favorites in your recipe box and are all about helping you create your own delicious memories around the table with family and friends. Martina McBride, a Kansas native, and country music icon who made her debut on the charts in 1992, and has earned a string of hits across 13 albums, including "Blessed," "Independence Day," "A Broken Wing," "Wild Angels," "Concrete Angel," "I'm Gonna Love You Through It," and “Everlasting.” She has sold over 14 million albums and to date is tied for the most Country Music Association Female Vocalist of the Year Awards with four wins, has been named Academy of Country Music Top Female Vocalist three times, and has been nominated for fourteen Grammy Awards. She is the author of Around the Table: Recipes and Inspiration for Gatherings Throughout the Year. She lives in Nashville, Tennessee, with her husband and three daughters.